Laie, Hawaii – Oahu (HawaiiNewsNow) By Lisa Kubota. A sacred discovery is complicating the construction of a new hotel on Oahu’s North Shore. 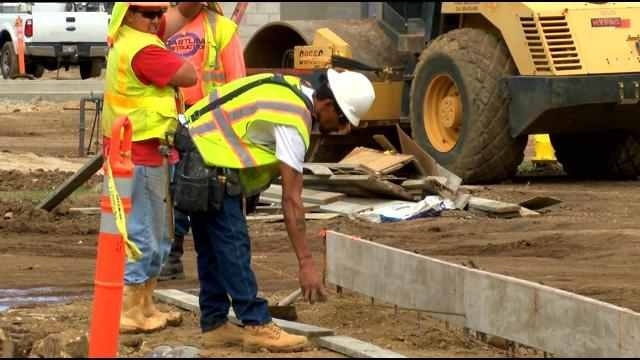 Workers found what are believed to be Hawaiian remains, or iwi, at the site of the future Courtyard by Marriott in Laie. The new hotel is going up next to the Polynesian Cultural Center on the site of the old Laie Inn. The land manager said no bones were found during the archaeological survey for the environmental assessment that was completed before construction started earlier this year. On December 9, a subcontractor came across the bones while digging out the area for the hotel pool. The land manager said the workers notified the project’s archaeologist who then contacted the state. “Basically immediately covered the bones, I understand, in some muslin cloth and put a lauhala basket cover over them,” explained Eric Beaver, president of Hawaii Reserves, Inc.
Hawaii News Now has learned that the workers found some teeth and part of a human jaw. Beaver said the subcontractor halted all construction around the pool which is in the middle of the hotel property. The State Historic Preservation Division is working with the project’s archaeologist and the Oahu Island Burial Council. There is no timeline for a decision by the state. “I think they’re trying to determine whether the bones should be left in place or reinterred somewhere on the site or off the site,” said Beaver. 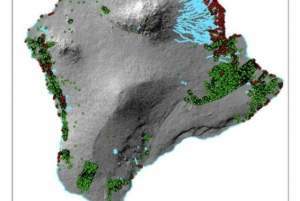 Some are concerned that the discovery could be part of a larger burial site. “I have no idea as to whether there are more bones in the area. I don’t get that sense so far from what we’ve heard, but we’re working with the contractor,” Beaver said. The 144-room hotel is slated to open next summer. Beaver said the project is still on schedule for now. “With the holidays upon us and Christmas season, it’s probably at this point okay, but I think that my guess is probably in January they would like to have a determination made,” he said. Hawaii Reserves, Inc. prefers that the iwi be relocated to a cemetery in the community that the company also manages. HRI is in charge of the property belonging to the Church of Jesus Christ of Latter-day Saints. Sinkhole by East-West and Dole. Traffic is being redirected as a result of a sinkhole by the corner of Dole Street and East-West Road Monday evening. University of Hawai‘i officials said they first caught sight of the sinkhole around 8:20 p.m. 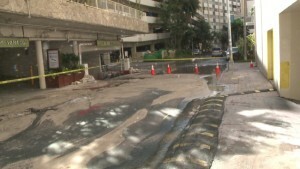 UH officials said the sinkhole appeared to be one foot deep, with a three-foot diameter and was concaving in. 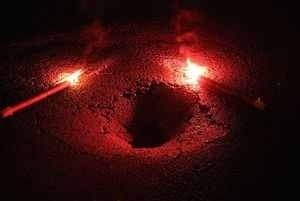 Honolulu Police placed two flares around the sinkhole for passing vehicles and pedestrians. Police said that county officials were alerted of the sinkhole and will repair it sometime this evening. 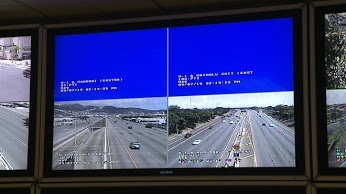 Kalanianaole Highway is back open Friday. State crews spent the night fixing a large sinkhole in the road near Mekia Street in front of Shima’s Supermarket. The road was reopened at around 4:30 a.m. 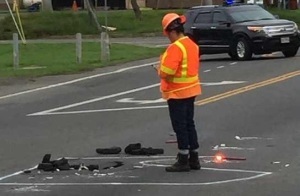 While the hole did not look all that large on the surface, the state Department of Transportation said it was seven feet wide and six feet deep beneath the pavement. Traffic was detoured and, because the highway is a road many rely on to get home, drivers were forced to sit in gridlock Thursday evening. “Crazy. It’s the biggest, longest line I’ve seen in my life,” one driver said. “We’ve been here (sitting in traffic) for 40, 45 minutes, maybe?” another driver said. Officials said the hole was likely caused by a sewer pipe. By Wyatt Olson – Stars and Stripes. FORT SHAFTER, Hawaii — A local historian is convinced he’s located the site where a two-man Japanese dive-bomber crew crashed on the morning of Dec. 7, 1941, and was buried nearby: the tony grounds of Hoakalei Country Club Golf Course in Ewa Beach. But the golf course’s owner, Haseko Development, has been less than receptive to the idea of an active search for the grave on the property, which the company announced in October was being sold to a Japanese firm. Haseko Vice President Sharene Saito Tam said the company has done all it was required to do in identifying culturally and archaeologically significant artifacts on the property during development and has found no evidence of such a grave. Further, she said, Bond does not have documentation that pinpoints the gravesite’s exact location. Of the roughly 60 Japanese troops who were killed or lost during the Dec. 7 attack, many were buried in various cemeteries on Oahu but were repatriated after the war. About 30 Japanese remain missing from that day. One notable memorial to a Japanese airman stands in Marine Corps Base Hawaii in Kaneohe Bay on Oahu. A bronze plaque marks the spot where Lt. Fusata Iita, commander of the 3rd Aircraft Group of the Japanese Imperial Navy, crashed his plane on a hillside near Kansas Tower that morning. Iita’s body was long ago returned to Japan. The defense attache with the Japan consulate in Honolulu said the case of the two Ewa airmen is “a difficult situation” for Japan because the site is private property and the owner says there’s no evidence to back up Bond’s assertion. During the past few years, Bond and a group of historians specializing in the 1941 attack have gathered extensive documentation and photos about the crash site, which had been lost to time and land development. Even Tom Dye, the archaeologist contracted by Haseko to monitor its land development, admitted that Bond and his colleagues have “done an incredible amount of work” in tracking down photos and accounts of the crash. Comparing old photographs and military reports from the time of the attack, Bond said he has calculated the crash site lies within a 50-yard radius of the golf course’s club house. Bond contends that burying bodies beside crash sites was common in that era. “If you had a crash and couldn’t extract the people out, you just buried them by the plane,” he said. Dye said that even if the exact crash site is pinpointed, there’s no direct evidence indicating where the bodies were buried. Bond suggested that ground-penetrating sonar could be used to detect the grave. Bond has written a request to the Joint POW/MIA Accounting Command, which is tasked with locating and retrieving the remains of U.S. servicemembers lost overseas, requesting that it take an active role in searching for the grave. “Getting involved in another nation’s recovery event is not something we’d typically do unless it was in the course of one of our own investigations,” JPAC spokesman Lee Tucker said. The agency has in the past provided research assistance to the Japan Ministry of Health, Labor and Welfare’s Social Welfare and War Victims Bureau, which oversees such recoveries. Tucker said the Japanese government did not require JPAC’s assistance or approval in searching for remains in Hawaii. But Takeshi Ogino, the defense attache at the Japan consulate in Honolulu, said Japan did not have a comparable agency such as JPAC to research and retrieve MIA remains in foreign countries. 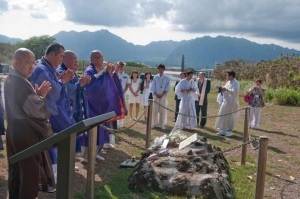 He said the consulate had not received an “official request” from either Bond or the Haseko group in regard to searching for the airmen’s grave or commemorating the crash site. Haseko’s Tam said that if Bond produces “additional information and evidence that we can authenticate,” the company might consider further search. But Bond contends that the time to actively search and recover the remains is now, as the 73rd anniversary of the attack nears. “If a decent search was done they could be found,” he said. Responding to public opposition, the state Department of Health dramatically watered down its proposed rules phasing out cesspools, but it’s unknown if Gov. Neil Abercrombie will sign the package before he leaves office Monday. The new rules would apply to just 13 percent of the 49,344 cesspools on Hawaii Island, and 22 percent of the 87,969 cesspools statewide. Instead of requiring all cesspools be converted to septic systems upon the transfer of property, the new rules would apply only to cesspools within 750 feet of a sensitive water body or near a drinking water well. In addition, the grace period for a cesspool to be converted upon transfer of the property will be extended from six months to one year. And, the rules won’t apply to transfers of property where money doesn’t exchange hands, for example, between family members. The Health Department also proposes to offer grants or no- or low-interest loans for the conversion process. Lots of 1 acre or more in new subdivisions will be allowed to have individual rather than gang septic systems. Exemptions may be granted for properties that can’t accommodate a septic system and leach field. “Pretty much we covered most of the concerns that were voiced during the public comment period,” Sina Pruder, chief of the department’s Wastewater Branch, told West Hawaii Today on Tuesday. The Abercombie administration had pushed for the rule change to meet federal clean water requirements and to battle pollution of coastal waters and drinking water supplies caused by human waste bacteria. Hawaii is the only state in the nation that still allows new cesspools to be constructed. Hilo Realtor Robert Williams called the revisions, “a step in the right direction,” but he said the rules governing small subdivisions weren’t addressed. The revised rules would still require subdivisions of 15 homes or less to have a central septic system. The current rule allows cesspools for subdivisions of 50 homes or less. 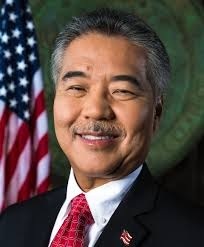 Ige may favor a legislative approach rather than a rule-making one, said Williams, who has been following the issue closely. A bill favored by the administration failed in the past legislative session. “It’s not 100 percent dead, but it seems that the governor’s not likely to sign this,” Williams said. “I’m hopeful that they take the topic up under the new administration and hopefully, it’s done better.” Calls to the governor’s office were not returned by press time Tuesday. The Health Department received more than 230 public comments. The proposed revised rules were published Nov. 13 and can be found at health.hawaii.gov/wastewater/home/public_notice.